The new bus leaves on time from the central bus station of Floriana, just outside the ancient defences of Valletta. The day is still young, but despite the early start, you still feel the unrelenting heat of the Mediterranean sun every time the doors open to let people on and off. The winding roads take you past medieval stone buildings that house cafes and pastizzerias. The hot ricotta filled cheese pie has left you feeling stuffed, but ready for your excursion south of the capital. The urban roads of Malta were not designed for automotive transportation and there are times that you feel like the bus has to almost scrape between the buildings to get through. 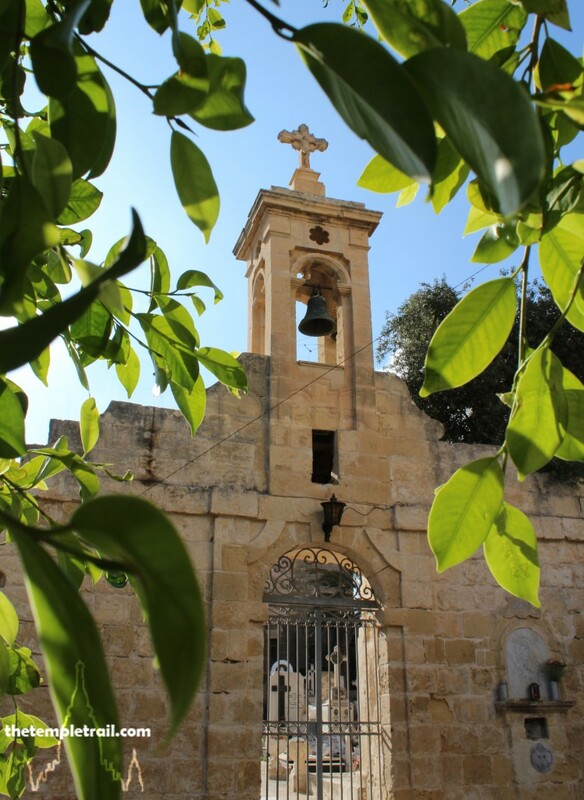 The crusader history of Malta is obvious and all around you, as is the Semitic language that is spoken making you abundantly aware of the Arabic legacy of the Lilliputian island. Your journey is taking you toward something that goes much further back into antiquity than anything in living memory. Getting off the bus in the small town of Tarxien, you note that the bus stop is named Neolitici. It is a huge indicator of the site that awaits you. After getting a cheap milky coffee in a local ftira sandwich joint, you bound down the tight streets energetically to the Tarxien Temple complex; the largest on Malta. Before you actually reach the temples, immediately preceding them is a graveyard that has been in use for several hundred years. The old tomb markers bear the names of local families who have continuously lived in the area since the Knights Hospitaller of the Order of St John were the rulers of the defiant island nation. Passing the cemetery and approaching what looks like a house, you enter through the ticket hall into the blinding solar rays. What lies in your path looks like a pile of stones, but as you near, they take on a more orderly shape and the structures rapidly become more distinctive. The temple complex sprawls out around dry scrub area between the more modern buildings. 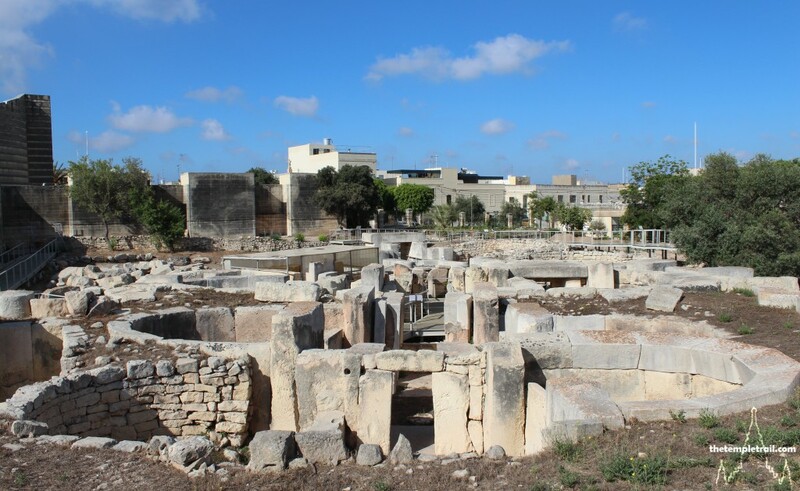 Built during the zenith of the Temple Period in Malta, Tarxien saw different phases of construction and renovation for more than a thousand years. Starting at the corner of the South Temple, you follow the path around the western and northern edge of the Neolithic complex. Huge blocks of stone mark the cusp of the compound. Treading the path with the unforgiving sun beating down, you are given a panoramic view of the site from a good vantage point. The ancients would not have been able to see what you see today, as the temples would have been roofed. As you come to the eastern extremity of the complex, you arrive at the earliest construction phase. The low-lying ruins are the least grand of what is left. This section was built around 3600 BC and is a more ruined miniature version of the other temples on the site. The front once had a concave façade and it was made of five apses that constituted the worship chambers. 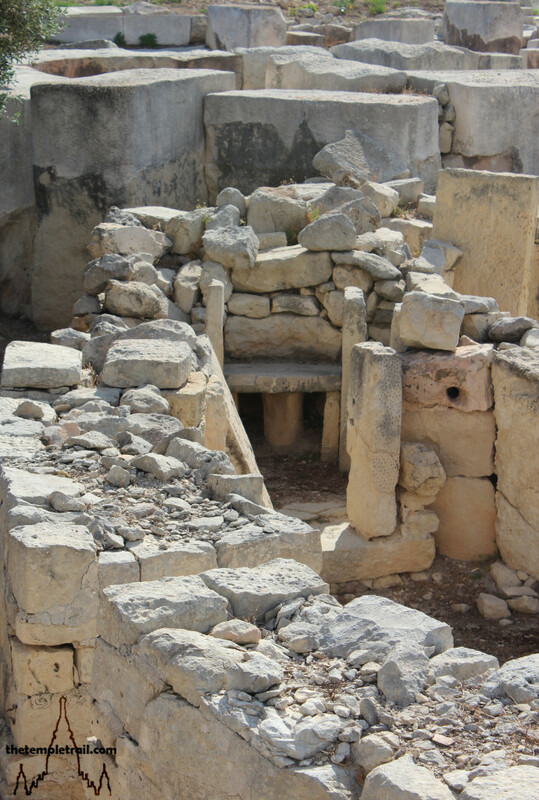 It shows that over time, the layout of temples in Malta didn’t stray much from a time-tested formula. The sturdier walls of the next oldest structure, the East Temple, immediately follow as you continue your route. 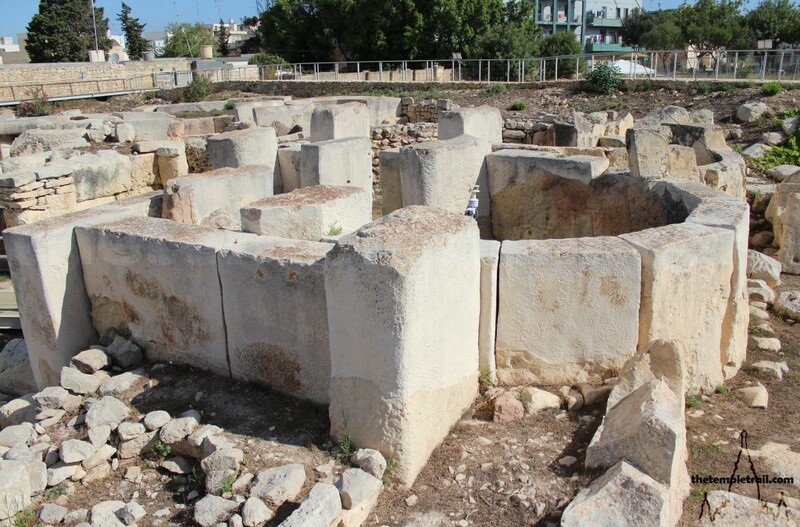 This is the first of the temples to be built during the Tarxien Phase of 3000 – 2500 BC. It is the least intricate of the temples of this era and was remodelled and decorated on the building of the later parts of the complex. The floor of the East Temple is quite remarkable as it is original. Looking in, you observe the torba (ancient Maltese cement made of crushed limestone) floor. Passing the simple apses of the East Temple, your path takes you by a set of stairs and through into the first set of apses of the latest and most uniform building; the Central Temple. The Central Temple has six apses in three pairs of ever decreasing size. Standing in the largest set, you are enclosed in huge stone slabs. The apse ahead of you has two trilithic altars and the remains of a corbelled roof. Exposed to the sun, it is hard to imagine these spaces shrouded in darkness, perhaps lit only with the flickering of fires. 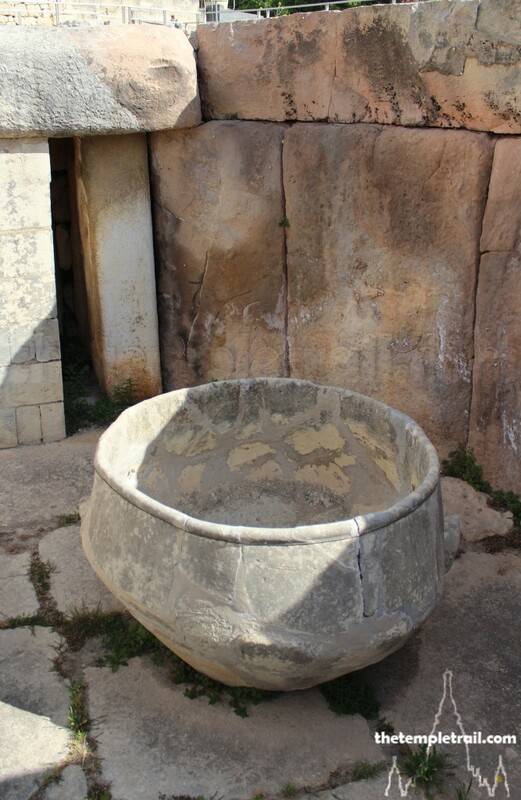 In the apse, on a megalithic slab floor, sits a large carinated bowl. The ceramic is huge and whatever ritualistic purpose it held, it helps you picture the atmosphere that would have been present here thousands of years ago. Standing between the two large chambers, you look up into the second and third set of apses. 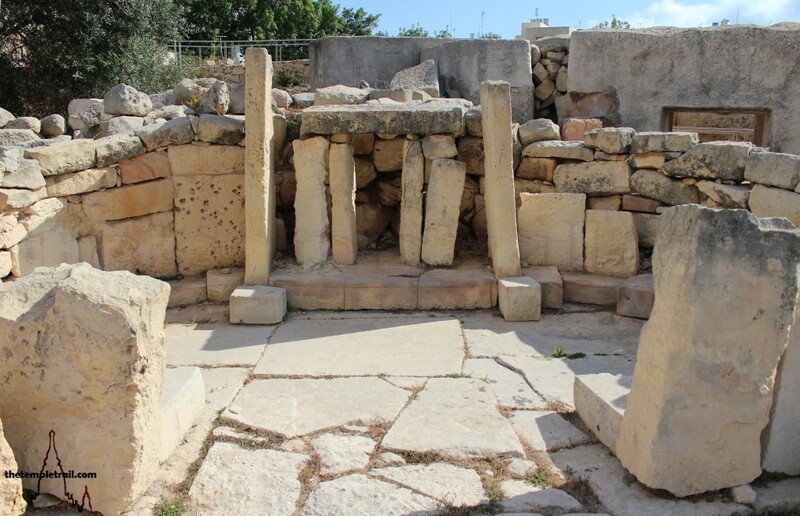 You cannot pass into them, but neither, probably, could many of the ancient people of Tarxien. 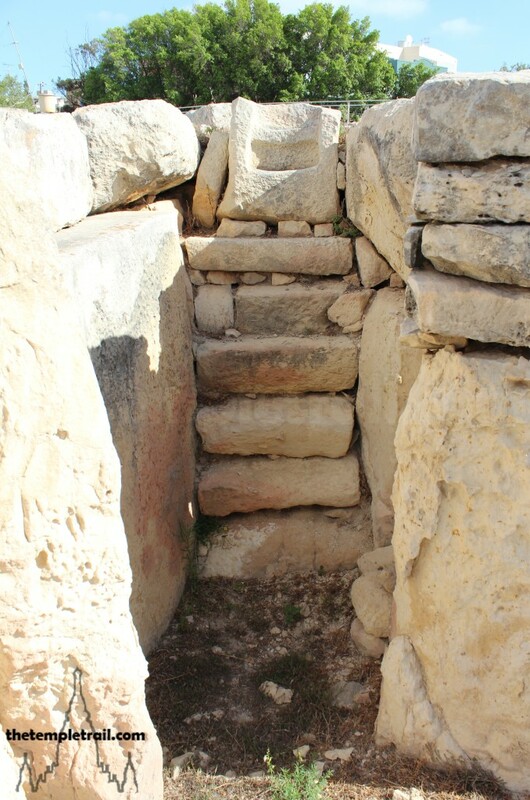 The doorway has a large slab on the threshold that symbolically restricts access to the two deeper chambers. The original now rests in the archaeology museum in Valletta, as do many of the key pieces of the structures. The replica has been heavily eroded, but you can just about make out the double spiral motif that adorns it. Clearly, the access was restricted to an elite few. Holes in the stone doorframe indicate ropes once held wooden doors to partition the area from sight as well. After looking beyond into the once hidden sanctum sanctorum of the Central Temple, you head away from the most sacred heart of site, you move towards the last of the temples. The main doorway to the Central temple takes you to the middle set of apses of the South Temple. It was built after the East Temple, but before the Central Temple. 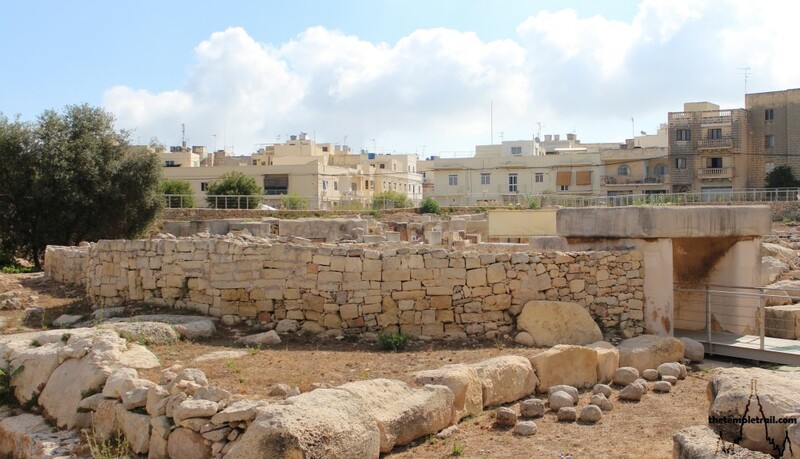 Of the three, it holds the most interest as it is filled with the crafts of the dextrous temple builders of Malta. From where you stand, you can see the altar in the holiest of holies of the South Temple. The threshold into it is also raised and decorated with spiral motifs denoting limited access. As is normal, a portal altar is at the heart of the sanctuary. Walking between two large stones, you come to a highly decorated section of the site. The first set of apses of the South Temple is full of activity. The apse to your right looks the most dilapidated, but upon closer inspection, you see stone altar sections carved intricately with processions of domestic animals. Pigs, bulls, goats and rams are all represented. These animals were not only reared for food, but may also have been sacrificed. The fact that the animals shown are mostly male would go some way towards supporting that. Turning around to the other apse, you see an ornately decorated and raised altar. One of the spirals hides a cavity that contained the bones of various animals and some flint blades. This was an important altar and it reinforces the theory of animal sacrifice. These rooms were once filled to bursting with pots, pedestals, figurines and fabrics. 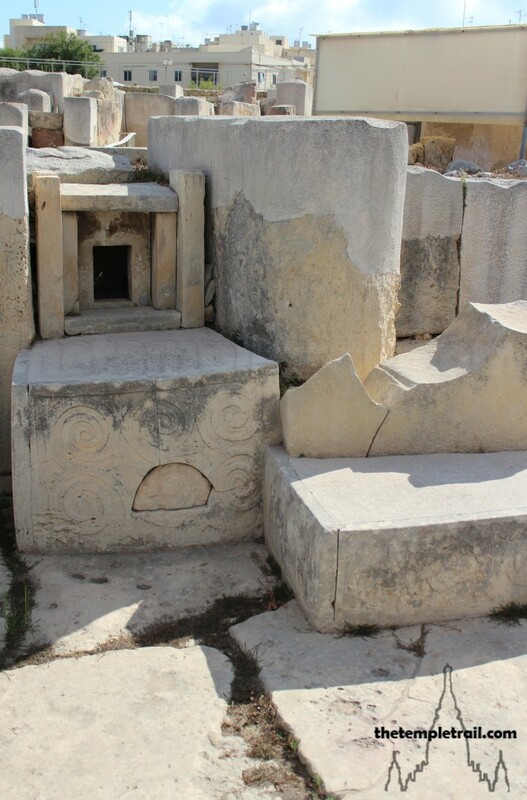 The spiral design can be seen on other stones nearby and the continuous usage of the pattern shows its significance among the Maltese people. It is prevalent across Neolithic cultures and is one of the most universally favoured of the time. It has been suggested that the spiral is variously a representation of eternity, heavenly bodies, star maps or the visuals experienced while under the influence of hallucinogenic shamanic substances. In the same apse, you see the swollen balloon legs of an enormously fat figure. The statue is referred to as a Magna Mater (great mother) and is presumed to be a steatopygous woman. The figure of an obese Earth Mother as a fertility symbol makes perfect sense in the Neolithic setting and was prevalent all over the contemporary Mediterranean cultures. From the Palaeolithic period through to the Minoan Bronze Age culture of Crete, the mother goddess cult was ubiquitous in Europe. 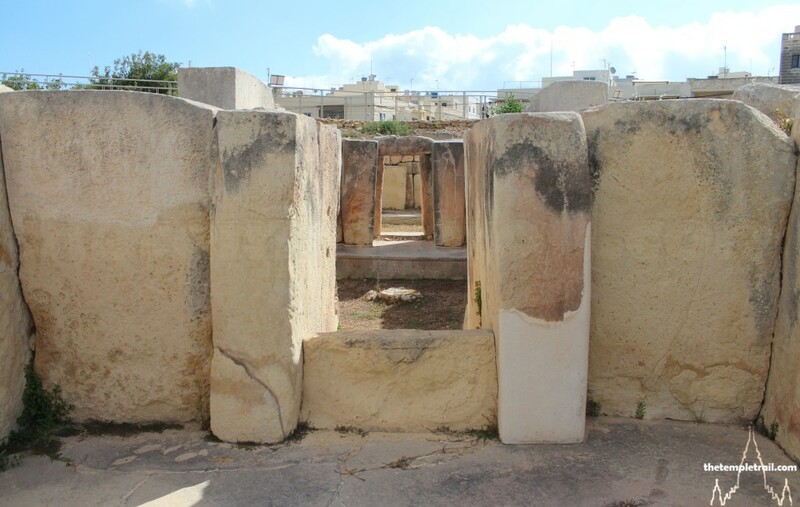 The rise of the goddess Demeter in the Neolithic would correlate with the Magna Mater of Tarxien. Despite all of this, it has also been put forward that it is in fact a male figure, although the evidence is not clear. Stepping through the huge reconstructed trilithon (two stones with a lintel as the third stone) doorway, you pass a tethering place for animals, perhaps waiting to be sacrificed. Going by a cistern, you look back at the huge doorway that was put in place in the 1950s. The whole front of the temple was a concave wall that was several courses tall. It would have been an imposing building. 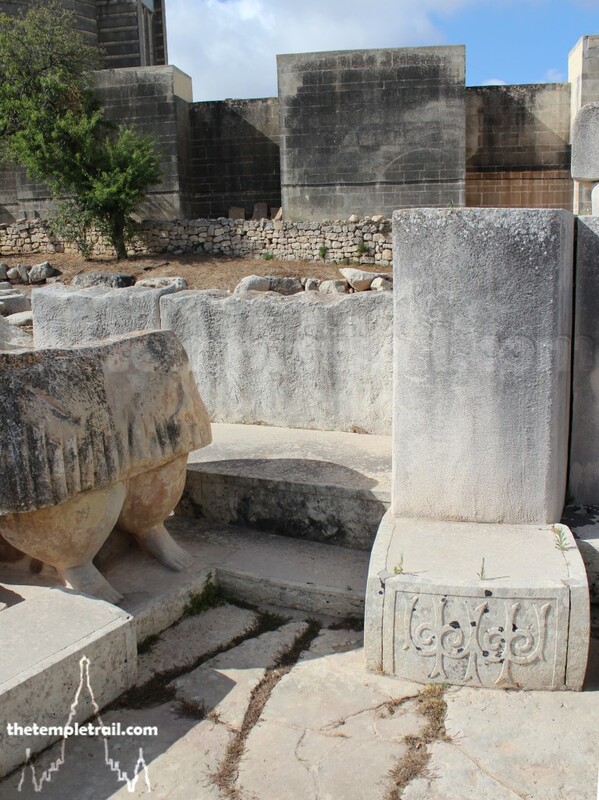 At the bottom right corner is a set of basins used for ritual libation. The temples hold on to their mysteries, but regardless of their original function, its later use is clear. After the sudden end of the temple building era, the site continued to be used by the Bronze Age inhabitants of the area. Rather than use it as a temple specifically, it was employed as a cremation cemetery. During the Neolithic phase, the islanders buried their dead. Suddenly, they began to cremate them and place their ashes in urns. This, ultimately, became the purpose of Tarxien. Perhaps it was for the elite, as the Central Temple has yielded offerings of copper tools, fish vertebrae jewellery, shells, pebbles and discoid figurines that have been scored with shark’s tooth marks. The charnel purpose of the land of this area has continued, and the old cemetery nearby echoes the Bronze Age use of the site. The newish chapel in the centre of the cemetery even takes stylistically from the original façade of the South Temple. Like a perpetual cycle, the history of the site continues to impact on today. Walking back through the old house that conceals the ancient structures, you return the present and reflect on the transitory nature of the world. A temple complex used for thousands of years is forgotten for thousands of years and rediscovered in the twentieth century. Things that are important cease to be important and then disappear. Perhaps they will be uncovered, but their true nature will always remain buried.